Informative, inspiring, and innovative are the three key words that come to mind when I reflect upon the most recent salon event hosted by the Geena Davis Institute on June 10th at the Google LA offices. “Women Pioneers in a Galaxy Far, Far Away” aimed to unite the arenas of media and science highlighting the current reflection (or lack thereof) of women in each of these fields. The result was an eclectic and unique blend of panelist who represented real-life science, media creators, as well as those who blend both worlds both in front of, and behind, the camera. Beginning with the generous reception and opportunity to mingle with highly talented and interesting people, the environment of the event was electric. It was clear that everyone in attendance felt passionate about supporting the mission of the Geena Davis Institute on Gender in Media. What became crystal clear as the panel discussion ensued is that it is essential to make significant strides in seeing more women as scientists of varying kinds, as well as women playing those roles in the media. As was so eloquently highlighted throughout the panel discussion, young girls and women must see it in order to be it. As a clinical psychotherapist working in private practice, I specialize in working with girls and women of all ages. What has become abundantly clear to me through my clinical work is that media, in all its forms, tends not just to be unsupportive of women, but can be harmful. The lack of visible positive female role models, in both the “real world” and the world of entertainment, plants deep subconscious messages to both men and women that somehow women are not capable, worthy, or significant enough to be seen. Nothing could be further from the truth, and nothing could be more damaging to our culture and our youth. What has drawn me to the work of the Geena Davis Institute is the direct and meaningful impact that simply seeing more women will have on all of our lives. On screen, behind the camera, and in general in positions of influence across the spectrum of fields, we will begin to build up women’s value in the eyes of the global community which will then empower women to step fully into their power having seen positive images of women reflected in the world around them. It is a profound and necessary step in creating a cultural shift that will support and uplift us all. A rising tide lifts all ships, and we—men and women alike—will benefit from this change on many levels. Never give up! When the going gets tough, push harder and keep your eyes on the prize! Most women working within the field of science or with the media have some type of “war story” to share about what it means to be a woman in what is right now a “man’s world.” The importance of sharing these stories is to learn and grow from them while supporting women in their uphill climb to break down barriers and reach new frontiers. What we, as adult men and women, do now will influence and impact the path for our children and young adults. Although it can be a challenge to be the pioneers and lead the way, we will create new opportunities for women everywhere by clearing the path with our hard work and dedication. Women are desperately needed in the fields of science and technology! By showing more women in the media playing roles related to science and technology, we have an immediate and tangible way for girls and young women to be inspired to explore those fields as they move through their academic careers. The beauty of combining science with media is a reflection of the intersection of the arts with science itself. The more we can see and understand what science is all about through its representation in media, the more we can entice our youth to engage in these arenas as potentially exciting professional opportunities. It was truly and honor and pleasure to be in the company of such talented people all focused on this pivotal cause. I certainly hope that all of you will attend the next salon event on August 6th and will continue to actively engage in supporting the work of the Geena Davis Institute on Gender in Media. Through this important work we can positively impact the lives of girls and women and help to shift and shape a new culture that represents women as valued and important contributors to our world. 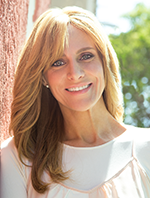 Mia Adler Ozair is a clinical psychotherapist and founder of the Channel 4 Change organization developing educational programming to support the empowerment of young women. She sits on the See Jane Brain Trust and is a volunteer contributor to the Geena Davis Institute on Gender in Media. Her website is www.miaadlerozair.com.